The Power Rangers have been getting a lot of attention in comics as the ’90s nostalgia engine roars on in pop culture, and the Justice League/Mighty Morphin’ Power Rangers miniseries is an exceptionally fun title that shows how the Power Rangers compare to some of the world’s most popular superheroes. 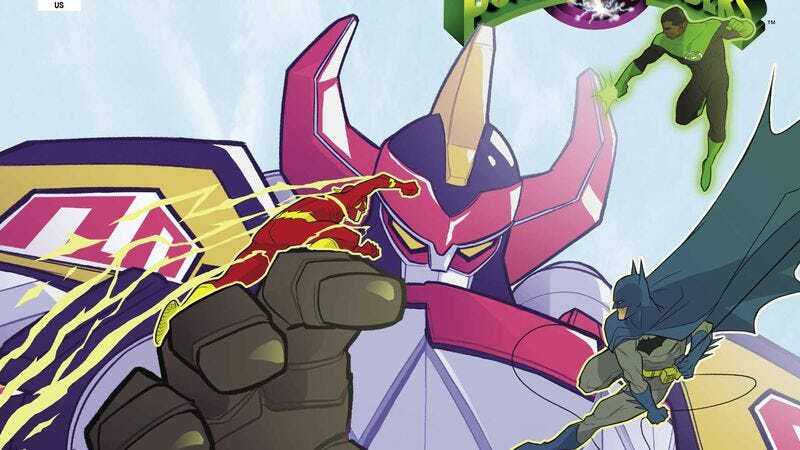 Written by Tom Taylor with art by Stephen Byrne, JL/MMPR puts the Power Rangers in the DC Universe, and while the story hits familiar superhero team-up beats—they meet, they fight, they sort out misunderstandings and team up—it’s done so with a sense of humor and an exhilarating energy that makes it very engaging. This is a book that can be enjoyed by the child audience that Power Rangers is marketed to as well as adult readers that just want a thrilling, enjoyable superhero romp, and this creative team is doing great work getting to the core of what makes this genre so popular. This preview of this week’s JL/MMPR #3 brings in even more DC superheroes as the two teams join forces to stop Lord Zedd’s giant monsters that are attacking major cities on every populated continent. Green Arrow, Black Canary, Aquaman, Mera, Shazam, Batgirl, Supergirl, Hawkgirl, Jessica “Green Lantern” Cruz, and the Teen Titans all join the fray in this issue, and it’s delightful to see Taylor and Byrne embrace the full scope of the DCU to give the two main teams some extra assistance. Byrne is one of the strongest new artists to join DC’s creative line-up (see: Green Arrow and JLA: The Ray), and the animated quality of his linework makes for expressive characters and dynamic action while his bold coloring adds dimension and amplifies the atmosphere. He’s clearly getting a huge kick out of bringing these two superhero worlds together, and that creative excitement has made JL/MMPR a crossover that delivers on all levels.